With one of the biggest collections of bow ties, ties, pocket squares, handkerchiefs, braces and mens accessories, it’s no surprise that Mrs Bow Tie is one of Europe’s biggest accessories brands. Specialising in premium British-made fashion, we are proud to supply some of the best wedding ties, professional work neckties and luxury bow ties for black tie events. Since 2014, we’ve been the number 1 site for velvet bow ties, and our bestselling range of flag bow ties have been worn worldwide, appearing on Eurovision Song Contest, Strictly Come Dancing, and in Hollywood movies. Whether you’re looking for pink bow ties, paisley ties for weddings, or a bowtie for prom, we’ve got something for everyone. We send items globally, with quick trackable shipping. Express delivery options available, ensuring arrival within days. View shipping destinations. Regularly complimented as "the easiest brand to work with", we've helped over 90,000 couples worldwide organise the accessories for their big day! Our products are made-to-order here in our UK factory, reducing the pollution and waste infamously linked to the fashion industry. Our packaging is also 100% recyclable! Our products come individually boxed inside our eco-friendly presentation boxes, saving you the hassle of gift wrapping. 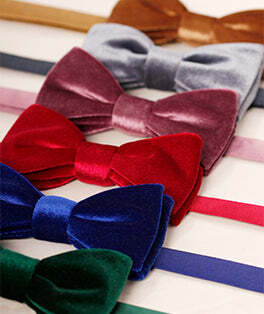 THE BIGGEST RANGE OF FLAG BOW TIES EVER!